ATV and dire bike riders hit the streets in Miami Dade County. MIAMI-DADE COUNTY, Fla.-- ATV and dirt bike riders in South Florida hit the streets for the annual "Wheels Up, Guns Down" MLK rideout. The group rides together every year on Martin Luther King Jr. Day to honor the civil rights leader. 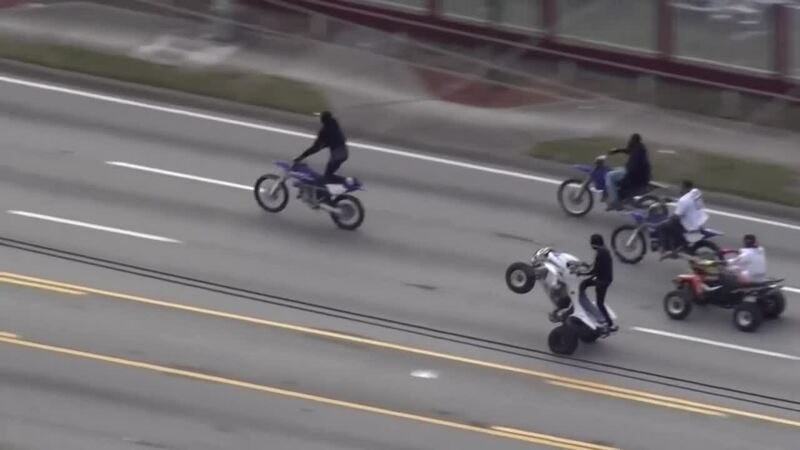 Aerial video shows the riders popping wheelies and riding along a busy stretch of road in Miami. Riders began taking to the streets on Friday, despite safety concerns from law enforcement. Police warned riders not to drive unauthorized vehicles on roadways. By 4 p.m. Monday Miami-Dade police said 21 ATVs/dirt bikes had been towed, three firearms were seized, seven citations issued and eight arrests had been made as a result of traffic enforcement efforts. The Broward Sheriff's Office said deputies seized 21 ATVs/bikes, arrested 10 violators and recovered one gun over the weekend.